Thrawsunblat is a completely different entity today than when Canada 2010 was released. Once a Woods of Ypres side-project, mastermind Joel Violette has turned the entity into a mighty force; recruiting former Mares of Thrace member Rae Amitay and Massachusetts madman Brendan Hayter to fill out the rhythm section and help him fully realize this massive concept album. Opening with a piano ditty that will make you think you’ve accidentally put on a Korpiklaani record, “Lifelore Revelation” explodes into furiously fun upbeat fare that sets the stage for the rest of Wanderer. Speeding tremolo melodies dance across gallop-happy riffs as Joel’s clearly ecstatic voice and solos flash by, moving ever forward. “Once Fireveined” reeks of adventure in music and words, a bombastic anthem that spits flame and thunder and results in an epic call to arms that would be welcome on a march to war. And the journey is just beginning. Barrelling forward, you’ll soon realize the album isn’t all fast melodic metal. On “Goose River” and “Maritime Shores” the Thraws crew go full folk, crooning of drinks and beauty over gorgeous acoustic pieces that transport you to a 19th century pub where all are strangers, but none are enemies. It’s refreshing to hear a hybrid band of this type using their lighter side for more than just cliché opening or closing tracks; these calmer excursions are full and rich and fit between the heavier pieces beautifully. Folk music has for too long been incorporated as a gimmick in the metal community and Joel and co. affirm its rightful inclusion by playing it from the heart with dedication and reverence. As you continue to be transported up mountains and across rivers the full-length becomes ever more familiar but never ceases to intrigue. Wanderer is clearly the result of years of hard work. The album is incredibly dynamic and varied, a folk-ballad here, a maddened blast there, and the feeling of the trials and tribulations of a life-changing journey permeate the hour long trip. 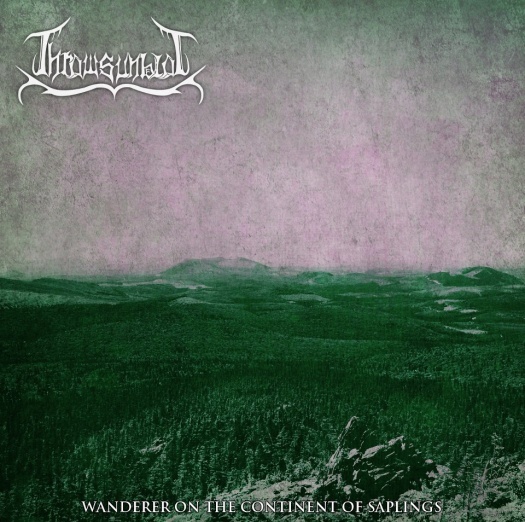 Black metal doesn’t have to be all satan and frostbite, and Thrawsunblat prove this with an uplifting tale of loss and exploration and the feeling of hope to match. I’m not sure whether the continent of which they sing is one of this world or another, but this Canadian mastery makes me want to start my journey towards it. Rae does not play for Mares of Thrace anymore. It's too bad about Mares of Thrace; "The Pilgrimage" was quite good. Yeah. One bands loss, another bands gain I guess. Are they officially over, though? A quick peruse of their Facebook page makes it seem like it's still an active band. I'm sure the guitarist will find another drummer to play with. Assuming she hasn't already, that is. I really like the dynamic that Therese and Stefani had, though. If you look them up on YouTube, there's an entire set of theirs that's really awesome.